Amid the demolition of the Larung Gar Buddhist Institute by Chinese authorities, the Co-Chairs of the US Congress’ Tom Lantos Human Rights Commission have written to the Chinese Ambassador in Washington to express concern over the destruction and related evictions in Tibet. Congressmen James P McgOvern and Joseph R Pitts condemned the demolitions as a clear violation of the religious freedom of the Tibetan people and urged the Chinese government to “reverse course, stop the demolitions and evictions, rebuild and restore the affected infrastructure, and permit all those people under Chinese jurisdiction who wish to pursue their Buddhist faith to do so without government interference or ‘guidance.”. The Co-Chairs of the United State Congress’ Tom Lantos Human Rights Commission, Representatives James P McGovern and Joseph R Pitts have, on Wednesday, written to the Chinese Ambassador to the United States expressing ‘deep concern’ over the forced eviction and mass demolition carried out by Chinese authorities at the Larung Gar Buddhist Institute in Serthar County in Eastern Tibet. The letter comes following emergence of reports, revealing large-scale demolition of the dwelling of Tibetan monks and nuns at the Larung gar and forced eviction of more than a thousand Tibetan monks and nuns at both Larung gar and Yachen Gar, another major Buddhist institute in Kardze, Tibet. 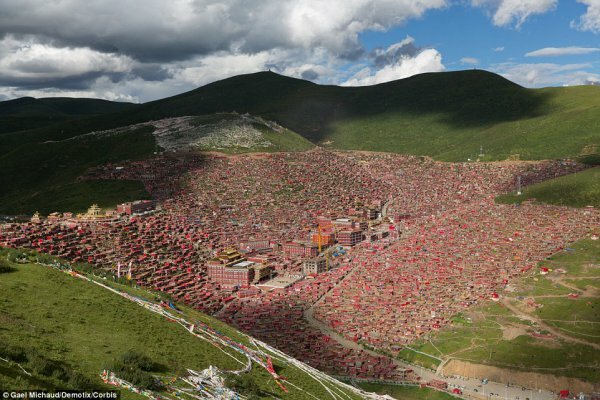 Larung Gar is one of the largest centers of Tibetan Buddhist learning in Tibet. The academy and monastery, founded in 1980, sprawls over a mountainside in Serthar county, Kardze Tibetan Autonomous Region (incorporated into China’s Sichuan Province) in eastern Tibet, and attracts thousands of Buddhist monks and nuns who wish to study there. However, it has been facing a demolition drive from the Chinese government following an order in July this year to cut the number of Larung Gar residents by half to 5,000.